As a Global Leader in Forage and Feed Analysis, we have the unique opportunity to publish some of our data Analytics from time to time. These Tech Notes serve as a canvas to provide our users a unique and timely perspective on current analytical trends. CVAS has put together a document to explain the various report terms that are used in our reports. This document is put together in two sections. The first provides information on newer terms and concepts; the second is a more exhaustive review of analytical terms used in feed testing. This document will provide a quick reference for those experienced in nutrition but not familiar with some of our recent report additions. The document will be good to support those as well that may be new to feed analysis reports and want basic information. Due to the drought in many areas of the country this year, the presence of Aflatoxins in corn based products has increased significantly. Aflatoxins are naturally occurring mycotoxins that are produced by many species of Aspergillus, a fungus. Aflatoxin, (M1) can be found in milk when animals are fed contaminated feeds, which creates a potential threat to humans. FDA has established action levels for Aflatoxin present in food to protect human and animal health. CVAS Introduces the Mobile App Kickback. As an information technology company, CVAS realizes the importance of data management and data integrity and the efficiency generated by utilizing current technology. The recent introduction of our FORAGELAB app is a commitment to that objective. As we continue to develop our mobile platforms, with YOUR help, use this credit toward your next mobile device. Download the Mobile Device Reimbursement form and submit to cwolff@foragelab.com . Why Use NDF Determined on an Organic Matter Basis (aNDFom)? There has been discussion lately that NDF should be determined by the forage laboratory on an “ash-free” or “organic matter basis”. Is this a matter of focusing too much on the details, or is this something that is a real issue for proper characterization of forage? Evaluating some lab data may help you to determine if this is worthy of consideration. The 2012 corn crop is out of the field and in storage. Corn silage and high moisture corn is in the process of fermentation change that will evolve over a number of months. 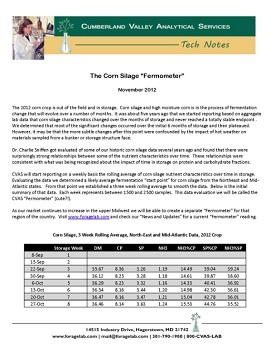 It was about five years ago that we started reporting based on aggregate lab data that corn silage characteristics changed over the months of storage and never reached a totally stable endpoint . We determined that most of the significant changes occurred over the initial 6 months of storage and then plateaued. However, it may be that the more subtle changes after this point were confounded by the impact of hot weather on materials sampled from a bunker or storage structure face. How is the NDF 240 hour in vitro digestibility value to be used? In the calculation of the rate of NDF digestibility, realize that we are considering the rate of digestion of the digestible portion of the NDF. NDF is composed of both digestible and indigestible fractions. As we are interested in determining the rate of the digestible fraction, we must define the indigestible fraction in order to subtract it out. The long time frame used for determining indigestible fiber has nothing to do with anything related to retention time in the rumen. It is strictly for defining the indigestible pool which allows us to the rest of the fiber in the digestible pool. There is argument then that the digestible pool of NDF should be partitioned into a fast and slow pool, but that is another discussion.